A perfect party starter. Cottage cheese cubes marinated and cooked in tandoor with a prominent ginger flavour. Main focus of this delectable dish is the marinade. Cut paneer (cottage cheese) into 1 1/2 inch cubes and keep aside. First marinade, apply salt, one teaspoon Kashmiri red chilli powder, half teaspoon garam masala, one tablespoon ginger paste, half tablespoon garlic paste and two tablespoons lemon juice over the paneer (cottage cheese) cubes and mix well. Set aside for half an hour. Second marinade, tie up yogurt in a piece of muslin or thin kerchief-size cloth and hang over a bowl for at least 30 minutes. After 30 minutes, drain out the excess water and remove the thick yogurt into a bowl. Add the remaining Kashmiri red chilli powder, salt, ginger paste, garlic paste, garam masala powder, half teaspoon black salt (or chat masala), tandoori masala (if available) and two tablespoons of mustard oil. Whisk until well-mixed. A nice natural orangish-red colour marinade is ready. Then, rub this mixture well over the paneer (cottage cheese) piece by piece, diced onions and capsicums (bell peppers). Marinate for 1 hour in a refrigerator. Remove the paneer (cottage cheese), onions and capsicums (bell peppers) from the refrigerator. Arrange the marinated pieces on skewers. Set aside for fifteen minutes before roasting. Pre-heat the Gas-Oven Tandoor for 5-10 minutes before cooking (very essential to get a nice smoky flavour). Once it’s nice and hot place the skewers and cover it up for 5-7 minutes. 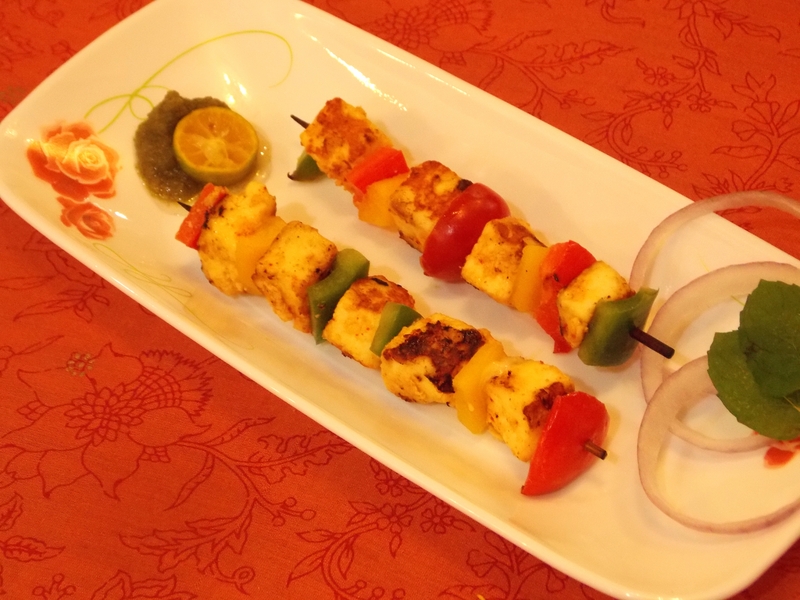 Alternative to Gas Oven Tandoor – Heat a non-stick pan and grill the skewers till golden brown. After 5 minutes remove the lid and turn the skewers top-side down. Cover and cook for 3-5 minutes. Then, remove the lid and brush it with salted butter and let it cook for a minute to get a nice smoky flavour. Take it out, brush it with little salted butter on top and sprinkle some chat masala. Serve hot with Green Chutney, Onion Rings and Lemon Wedges. Your tasty Adraki Paneer Tikka is ready.